More than 400 fonts are available. Text’s stroke color is changeable. Text’s shadow color is changeable. Text’s background color is changeable. 2. Choose ‘English’ in ‘General’ > ‘Language & Region’ > ‘iPhone Language’. 3. Turn back your ‘iPhone Language’ to your favorite language. 3. Select “Phonto” in the “File Sharing” section. 4. Drag and drop .ttf or .otf font files into “Documents”. This is the best photo editor app. Ever. This is better than PicCollage, Over, and other apps like this. PicCollage is great, it’s somewhat of a social media, you can use videos and photos from the web instead of photo roll, but the choices are very limited. There’s only 15 fonts, I believe. Over, sure, it’s good, but you mainly have to pay to really use it to even half of its potential. Pronto is beautiful. Most of the fonts that I like, especially ones from Google apps, are on there. I don’t have to add my own. It’s somewhat confusing at the beginning, but only because it doesn’t provide a tutorial. The basics of using it is pretty much everything on there. Just search up how to use it and stuff. 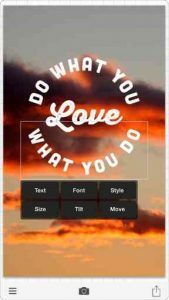 You can use the app to make quotes, business cards, logos, slogans, etc. If I were you, and wanted to take a photo from, let’s say, Safari for a pretty background, take a screenshot and click edit, click the weird right angles, and crop to your content. This is because Phonto only uses photos from your photo roll, and because the cropped is challenging to use for me, at least. I wish I could rate it with google stars! Get this! So I first downloaded this to create a simple menu for print. This was years ago—and because of the simplicity and functionality of Phonto, I have since learned how to truly use it to its fullest potential. I do social media marketing and graphic design, and even if I start making a design in another program, I finish it in Phonto. It’s my tried and True. I love that you can add your own photo images and fonts. I often use it in conjunction with a background eraser app. I also have a Cricut cutting machine, and I prefer phonto to cricut design space for designing. Please consider making a “save as” and “save” feature. The one thing that the app is lacking, is the ability to save your work as you go, and return to it later. If this feature became available, phonto would absolutely perfect. Don’t let the simple interface fool you, play around with phonto a bit, and discover its endless possibilities!